Now happily ensconced at the brewery they share with Bad Shepherd in Cheltenham, we can expect to see more beer and beers from Wolf of the Willows, including one-offs such as this. Scott and Renae McKinnon has collaborated with the team at Bloodhound Bar in Brisbane for the Hopfields event it's hosting as part of Brewsvegas. 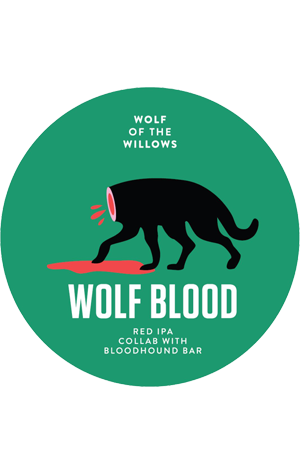 Wolf Blood is one of the collaborations to be launched on the night and is a punchy West Coast style red IPA. The brewers tell us it's all about "hops, hops and more hops balanced by lovely caramel malts." Those hops are of a "citrus, pine and stone fruit" bent with some toasted malt aromas, resiny hop flavours and a "dry rear palate and signature IPA bitterness" completing the picture. NB: Some of the Victorian kegs may have been tapped already but we were asked not to list the beer until the Bloodhound event so perhaps check with venues first.